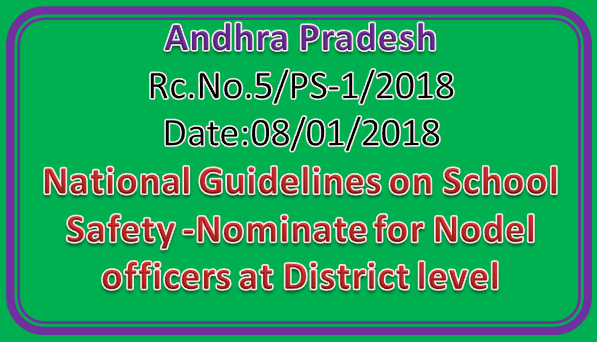 Sub:- School Education Department - National Guidelines on School safety - The state action plan for implementation of the said guidelines as well as details of the nodal officers (District Education Officers) nominated for monitoring the implementation matters at the district level - Information called for - Regarding. Read:-U.O.Note.No. 11644/DM.II/A2/2017, Dated:28.12.2017 of the Special Commissioner, Disaster Management & Ex-Officio Joint Secretary to Government, Revenue (DM) Department, Andhra Pradesh, Amaravati. The attention of the all the District Educational Officers in the State are invited to the reference read above (copy enclosed), wherein the Special Commissioner, Disaster Management & Ex-Officio Joint Secretary to Government, Revenue (DM) Department, Andhra Pradesh, Amaravati has requested to furnish the State action plan for implementation of the guidelines on school safety and details of the nominated Nodal Officers (DEOs) and also the report for the quarter ending October 2017 be submitted latest by 31 December 2017 and for the quarter ending December 2017 be submitted latest by 15th January 2018 to National Disaster Management Authority, Department of School Education & Literacy and Minority of Human Resources Development. Therefore all the District Educational Officers in the State arc requested to furnish the information through E mail by 08.01.2018 on supdt.ps1(ägmail.com without fail.